Anyone in the countryside away from city lights, or perhaps on a high mountain in the Alps, who has ever turned their gaze upwards on a clear night can perhaps understand why some people become so interested in the fascinating hobby of astronomy. Thousands of stars are visible, some thousands of light years away, as you stand with your mouth open trying to take in this natural showcase. Sometimes it is cold, with the wind whistling around your ears. But in the face of this wonder you could be in another world and you temporarily forget where you are. 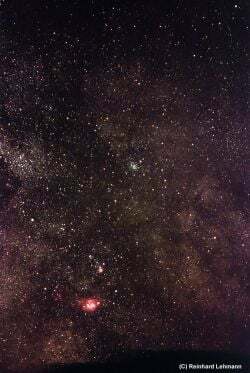 At first appearance the stars appear to be arranged more or less randomly - apparently chaos rules up there in the night sky. But once you have taken a closer look you will see that it's like a new place that you are unfamiliar with, where you first need a map to find your way around but gradually become more familiar with. Suddenly you can make out the figures of bears, lions, winged horses, hunters, hares and swans. These are all constellations: groups of stars that represent the shape of certain figures or animals. After having a taste of this naked eye astronomical lore, one is usually hungry for more. This involves assisting the performance of your own eye by artificial means. After the sun has set on a clear day and the sky changes slowly from blue to deep black, they are ready. The people who have impatiently waited for the night, and who have travelled, heavily loaded with their peculiar-looking instruments, to a suitable site in the open air. Most of them are using red torches, as bright white light is a definite no-no. Then have set up large tubes directed at a steep angle into the sky. These are often festooned with all sorts of technology. Now they direct these instruments to particular locations in the night sky and take a look through them. These instruments are commonly referred to as telescopes. Most of these people are quiet, not saying much as they observe. The rustle of the wind in the trees may be the only sound, but then sometimes there is an excited exclamation as one of these amateur astronomers (as they are called), suddenly observes some beautiful astronomical object. These people stargaze as a hobby and are typically passionately interested in the subject. All of these people, with various levels of expertise, were once beginners in astronomy. They typically began by observing with just the naked eye, trying to find the Big Dipper and other well-known constellations. These were the first steps before they decided to really pursue astronomy as a hobby. Then, usually, they would want a telescope. A visual aid with which not only the stars, but also other objects can be observed - galaxies, planetary nebulae, emission nebulae, supernova remnants and the objects in our solar system. But almost everyone starts by being faced with a huge selection of telescopes and accessories and the question of which is the right telescope for their particular astronomical interests. In order to avoid the frustration of purchasing a telescope and then only later realizing that it is not the right instrument for you, it is strongly recommended to clarify what it is you actually need. For this reason, you should also know something about the various advantages and disadvantages of different types of telescope designs. To keep all this jungle of possibilities straight in your head, you will need clear information. I want to help you find a path that is right for you. You can use the following pages to make yourself familiar with all the different telescope systems, the accessories available and the different types of observing.